I can’t say I loved Legally Blonde 2, but I have to admit that it was refreshing, thanks almost entirely to the bubbly, perpetually cheerful and energetic Reese Witherspoon. Some credit must also go to her screenwriter Kate Kondell. Between them, they give Elle Woods a heart of gold as shiny as her Barbie-perfect hair. 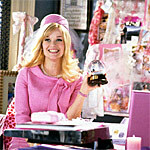 Legally Blonde, in which Elle goes from sorority babe to Harvard law standout. In what has to be one of the weirdest setups in Hollywood history, Elle can’t marry Emmett (Luke Wilson) until she tracks down the mother of her chihuahua, Bruiser, so that Elle can invite her to the wedding. She hires the best private eye her lawyer’s salary can afford, and discovers that Bruiser’s mom is in a cosmetics testing lab. All this is to set up the central conflict of the film: Elle’s Capitol Hill fight to outlaw animal testing. Elle starts out as an aide to the congresswoman from Massachusetts, Representative Rudd (Sally Field). Rudd assigns Elle to the animal testing issue, and after only a few days, she is discouraged. Rudd’s staff won’t take her seriously, much less help her with the bill. Before long, Rudd is working on other issues, leaving Elle with no hope. But Elle is the girl from Hope, and she never gives up. Rather than let herself get bogged down in the depressing politics of politics, she decides to find her own approach. She enlists the aid of Sidney (Bob Newhart), the doorman who knows more about the maneuverings in Washington than anyone else. One by one, Elle wins key congressional figures to her cause, until “Bruiser’s Bill” is a chihuahua’s whisker away from becoming law. A token piece of movie conflict arises. A villain rears her ugly head, saying, no kidding, “I’ll get her, and her little dog too.” But of course, Elle’s bubbly personality and her beauty-school wisdom win out in the end. Elle’s victory, while never in question, strikes a neo-feminist chord that ought to resonate with girls. A friend said Legally Blonde 2 let her feel validated for being feminine. Too many women have had to adopt a masculine stance in order to appear successful. Elle is a movie hero whose femininity is a strength, not a liability. The bubblegum script is just plain silly, and the ease with which even the coldest hearts in Washington melt is hard to swallow, even in this fantasy in pink. But the movie skates over the top of these criticisms, powered by its own peppy optimism. Witherspoon is a true movie star. If she puts her charisma into it, anything seems possible, no matter how silly or farfetched. Screenwriter Kondell knows just how to augment that charismatic power. She makes Elle sympathetic in defeat and magnanimous in victory. Even those who have been beaten by Elle Woods simply can’t hold a grudge against the power of her popularity. It’s interesting that just last week, The Nation published a piece on the linguistics of president Bush. The writer analyzed his statements and found them to be overwhelmingly negative for a politician, unbalanced by positive plans for action. The best type of rhetoric to defeat him is the can-do, optimistic spirit that Elle Woods has, the same spirit that helped Reagan beat Carter and Clinton beat Bush.